It's been a whirlwind week around here - last weekend we found out that there was an opening for Mason to attend the last session of Sky Ranch overnight camp and since he's been begging to go we talked it through, prayed about it, paid his tuition and printed off the packing list. Mason was MADE for camp - he's adventurous, social, loves meeting new people and lives for an activity-filled day and we have been so impressed with all the Sky Ranch programs we've experienced - and while it was an easy decision to let him go it's been a little tough on us (okay... on me) to "let go". We got there, got him all settled in, hugged it out and then he was all, "okay... see you guys on Saturday!" I felt like all the thumbs ups were his way of being like, "mom... I've got this!" ... look how stinkin' cute and excited he looked picking out his trunk last weekend! ... and then I bagged up his outfits for every day and labeled the bags as well. ... and I'm really hoping that it helps him find what he needs throughout the week (or at least that's what I'm telling myself to feel better thinking about him taking care of himself - hahaha). 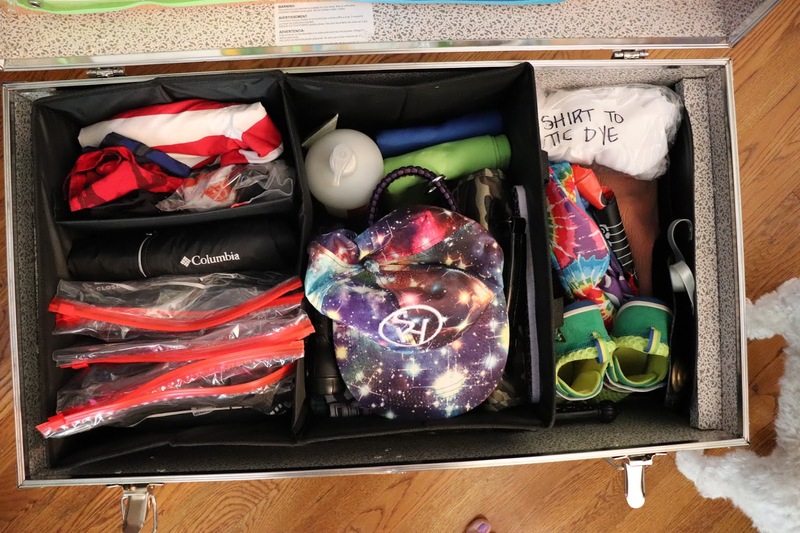 The top left section has socks, underwear and his bathing suit and swim shirt. The bottom left had daily outfit bags, a rain jacket and a hoodie. 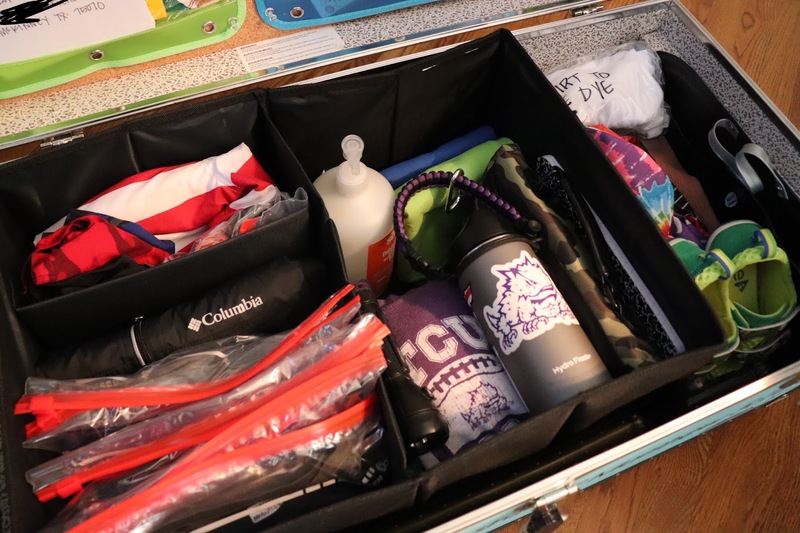 The large right section of the organizer had his bathroom stuff (the blue and green things are camp towels that are super compact and awesome), extra shoes, pajamas, water bottle, Bible, notebook, etc. He was so excited to pick the pictures to print and I was so glad that we did it because one of the first things he did when he got in his cabin was show his counselors the pictures. It was so sweet to see him talk about his pets and friends and family and get to share that. Amanda from That Inspired Chick ROCKED the vinyl stickers for his name and the Bible verse and she totally came through for me in a time crunch! 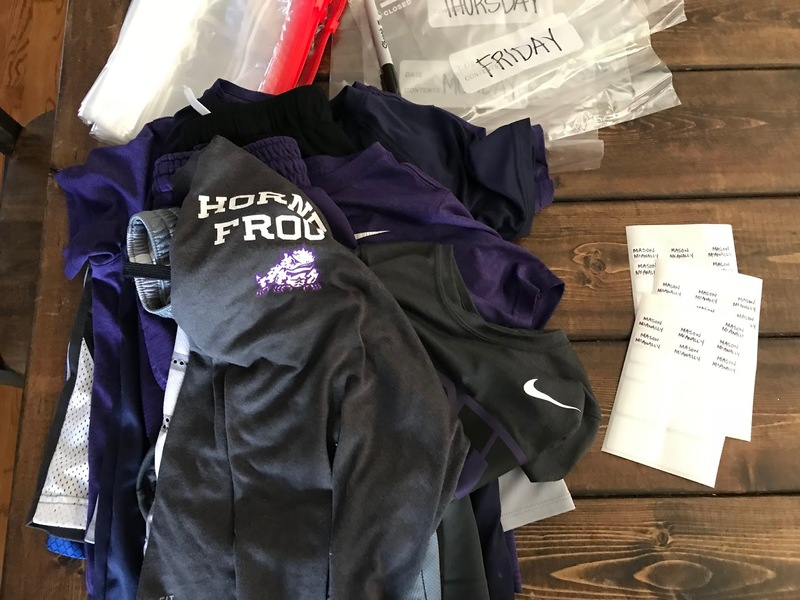 Thankfully we had some stickers laying around from TCU (duh! 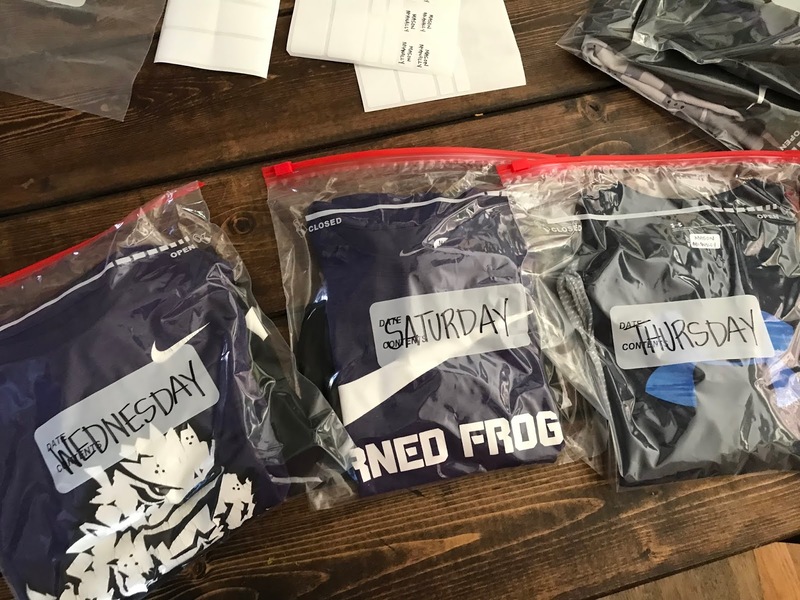 ), our last Vineyard Vines order, school and our trip to CO earlier this summer. I can totally own the fact that I am over the top with the notes - Mason LOVES and appreciates this kind of thing and I needed something to work on last week in the evenings :) I hesitated to share these but decided to go ahead in case and of y'all are sending kids off to camp and are looking for ideas. They have theme nights each night of the week and so I made my letters coordinate with the theme of the day and tried to keep them fun and light-hearted for him. Each of the notes and jokes went in one of these envelopes along with the little surprise I mentioned above and we just dropped them off at the designated spot when we checked him in. My parents also wrote him a note and included a surprise for each day and one of our very favorite families took the time to each write him a letter and so I put one of those in each of the envelopes as well. I can remember my mom always putting a lot of time and energy and thought into the letters and packages that I got from my parents at camp (I actually still have them!) and I was so excited to get to do that for Mason this year. Well - that's that! Now we just pray that he's having a blast and wait for Sky Ranch to post pictures every night so we can scroll through and try to spot him :) I'll be sure to share how he felt about camp once he gets back and we get to talk - I'm so hoping that I get more than a "it was all my favorite" response (moms... you know what I'm talking about!) but even if that's all that I get I'm confident that the experience will be one that he never forgets and getting to spend a week with counselors who are confident in and vocal about their faith will be something that sticks with him forever. Just picked my daughter up from overnight camp on Saturday and she had a blast! All her stories and new songs she’s singing make me wish i could go back to summer camp! Mason will have a blast! You should see if her camp offers a Mother/Daughter weekend or Family Camp. My daughter's camp does a Mother/Daughter weekend in the fall and it's SO great to experience camp (I never went as a kid) for a weekend alongside my daughter! You are seriously the cutest mom. But seriously, why aren't you an art teacher?! 1. I thought about Mason (and you!) all day yesterday!! 2. I was totally right about that trunk ;) . Amazing!! I feel like camp has Ashby London written all over it. Our girls need to go together! My oldest daughter started going to Camp Adam Fisher for diabetics and their siblings or friends when she was 8. She just turned 16 and still loves it! My youngest is 7 and she is much quieter and reserved and I can't imagine her wanting to be gone for an entire week. What an amazing opportunity for your daughter - and how cool that she still loves it so much! He was so excited when he talked about it at church yesterday. He’s gonna have a blast! I went to camp for a month starting when I was 7. It was the best thing I ever did because it taught me how to be independent. I am 30 now and I wish I could go back for one more summer. Yes!!! As much as I can prepare with and for him there’s something to be said for being “on his own” for a week. Adult summer camp sounds like a blast! I went to camp on the other side of the country for 3 weeks starting when I was 8. Back then I would barely even get mail while I was there because it took so long from tx! I was also a counselor all through college. it had the biggest impact on my life and I'm so grateful. I think this is one of the best things you can do for your kids! P.s. Knowing boys at summer camp I wouldn't be surprised if he counts swimming as showering and doesn't even open his trunk to change clothes the entire week hah! Three weeks?!?! That’s amazing! And as long as he has a blast I couldn’t care less about what he wears/doesn’t wear ;) although I do hope he showers at some point! Yay for camp!!!! I worked as a camp counselor every summer during college and LOVED it!!!!!! I always requested the youngest cabin (6-7 year olds) bc they were the sweetest age! Young enough to be thrilled with every little adventure and also worn out completely every night, so they didn’t have time to get homesick. Also, I loved it when parents would send outfits organized in bags by day- so helpful! Hope he haves a wonderful week!! What an awesome summer job! And yes... I have a feeling he’ll be wiped out at night! 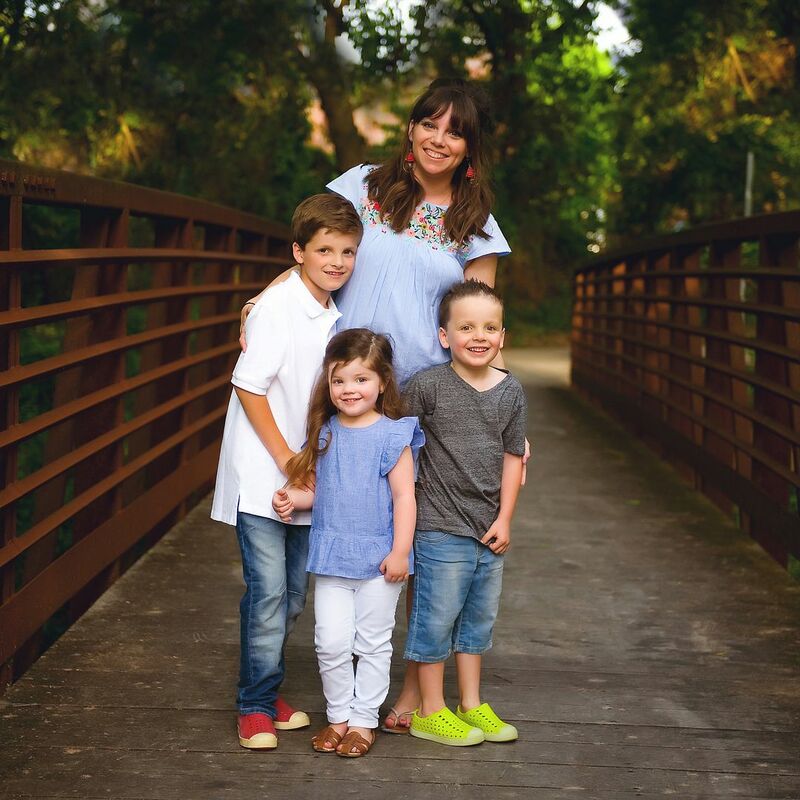 You really are an amazingly creative,living mom! He will be so happy to receive all of these! Hope he has a great week and hope you make it through ok! Ha! He ate it up which made it that much more fun - and sending a kid away for the first time it made me feel a little bit better about him being on his own. I went to camp and loved it.....but I don't remember ever having a note. Ha! HIS TRUNK IS EVERYTHING. Girl! I come by it naturally - my mom used to cut family pics out and put them into newspaper stories and do all kinds of creative things. Loved it! Girl! You’re so sweet! I’m always inspired by the moms who can just throw some stuff in and hope for the best.... hoping I can be more like that as years go on! Thanks so much for the kind commenrband for reading! Will you come and be my Mom? Seriously. My son went to overnight camp at Mason's age and ran out of underwear half way through the week...so he went Commando until we picked him up! Gross. So funny!!! I packed extra and left them in their own space for easy access. Fingers crossed he doesn’t forget where they are! I grew up going to camp for 15 years and it is still to this day the best experience I had growing up. I have made and kept life long friends and it's TRULY a place I will never forget. I also think its a place and environment that you truly become face to face with God in an uninterrupted way. So glad mason is able to experience that too! PS. next year you should pack him Chaco's. The ULTIMATE camp shoe. You can run and swim in them. I went to camp from 3rd grade through my senior year and was on staff there for 3 summers after high school. Reconnected with and started dating my husband there and met some lifelong friends. From a camper side and a staff member side, you've done a great job getting him ready! He may only wear the Monday bag all week (haha--seen that happen) but he will have the best time! Camp is the best! Your creativity is amazing! what thoughtful, sweet things you sent for your cute little guy, he will remember this always. Good job mama!! You are seriously the best mom! I am so impressed with the detail you put into everything. I can't wait to hear how Mason did! My daughter is doing her first day camp this week and I'm chanting the same thing in my head "please love it, please love it, please love it!" Thanks so much for sharing! Mason is going to have the best week! I went to one overnight camp as a child (3rd grade) and didn't love it. I swore off camp until I was a freshman at A&M and attended Fish Camp. I said I'd never make my kids go.... until this year when my 9 year old son wanted to go to Pine Cove. I was a nervous wreck and cried the entire way home but HE did GREAT! I was so inspired and impressed with camp that we have already signed up for Summer 2019! I can't pick a favorite about my son's experience because it was all so great. Ok, this will be a little long but I'm so passionate about summer camp!! I didn't get to go as a kid and always wanted to... so as soon as my kids were of age, I made it a priority to send them. The first time I dropped my oldest off (he was 9), I cried and cried and cried... it was awful! I'm an emotional person anyways and that was just hard... not for him but for me! And the first year my daughter went (she was also 9), I remember RUNNING to the mailbox every single day hoping for a letter (she goes for 2 weeks)... it's tough on us moms! But as I told you, holding onto the fact that you're giving them the gift of such great memories that they'll have forever plus some of the friends they'll end up having for life... well that right there makes all the mom emotions worth it! Camp has given my kids the gift of independence and confidence in ways I can't even articulate. I commend you for sending him... 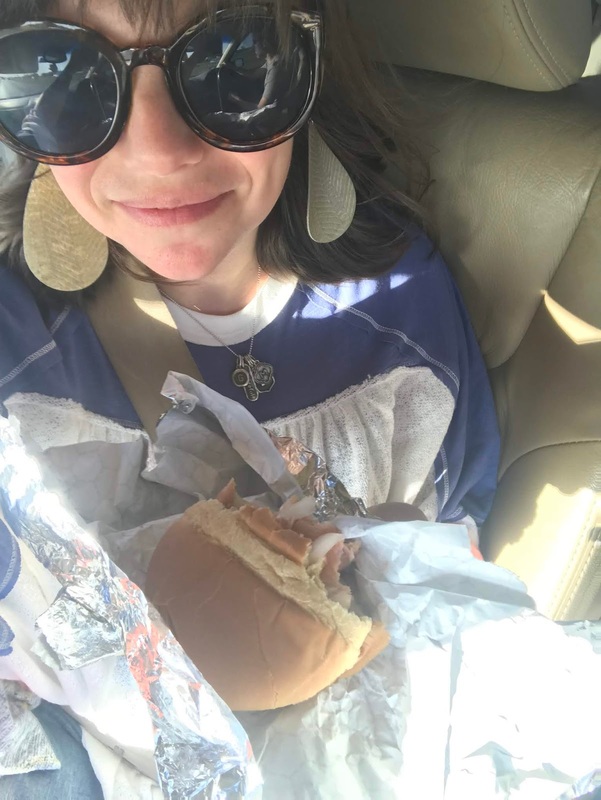 I can't even tell you how many times other moms have said to me when my kids go to camp 'oh, I could never let my kid go away from me for a week or two!'... and I just smile but honestly cringe inside. When I see how much they love it, how much they get to do that they'd never get to experience at home, bonds they create with counselors they look up to, and the memories they make with all of their new friends, how can I NOT send them?! I'm sure Mason will have the best time! Good job, mama - he'll do awesome this week and have the best time! SO many great ideas in this post. I never went to overnight camp but my little boy has been begging to go next summer. I think it is something we are going to look into and I am going to save these tips for next summer. Prayers to you Mama! I’m sitting at the pool in vacayion crying my eyes out! Thank goodness for sunglasses. This is the sweetest. I only went to overnight campnonce and it was not a good experience. So I worked at overnight camps in college and saw how awesome they can be. I can’t wait to send my son. He’s very social as well so I think that’ll be right up his ally!! I grew up going to church camp. If i honest it was not my favorite thing- I’m just such a homebody and need some downtime (extroverted introvert here!). But now when I think back on camp what I remember is the fun and friendships so!! My oldest never wanted to go and now at 13 I regret not having him try it when he was a couple years younger bc now he thinks he is too cool for camp. This summer my littlest two (7 and 8) did an overnight - which is what they offer for their grade level (2). They LOVED it! Big sis (age 10) went to the 6 day/5 night camp that they offer to her age group (4th grade). She had a blast and made tons of friends and memories. The littles were so ticked that she got to go longer - they didn’t think it was fair at all! It was a great experience for all three and they are already anticipating next year! I always print off a daily cartoon for my kids to open with the "mail" - they enjoy sharing with their friends. I bet he loves sharing the jokes!! CUTE trunk!! You are so organized! LOVE the trunk. Wish I had thought of that when my son was younger and went to camp. 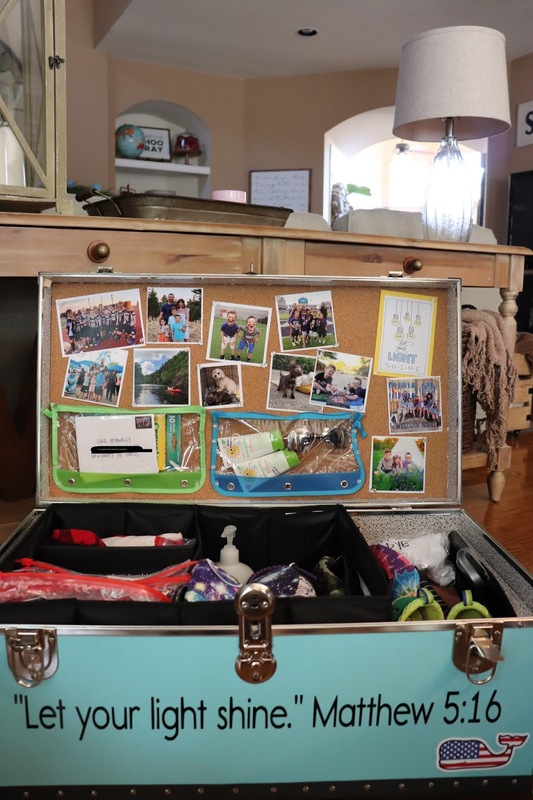 What a great way to help him stay organized during the week. I'm sure he's having a BLAST! I just wanted to say that you’re AWESOME!!! 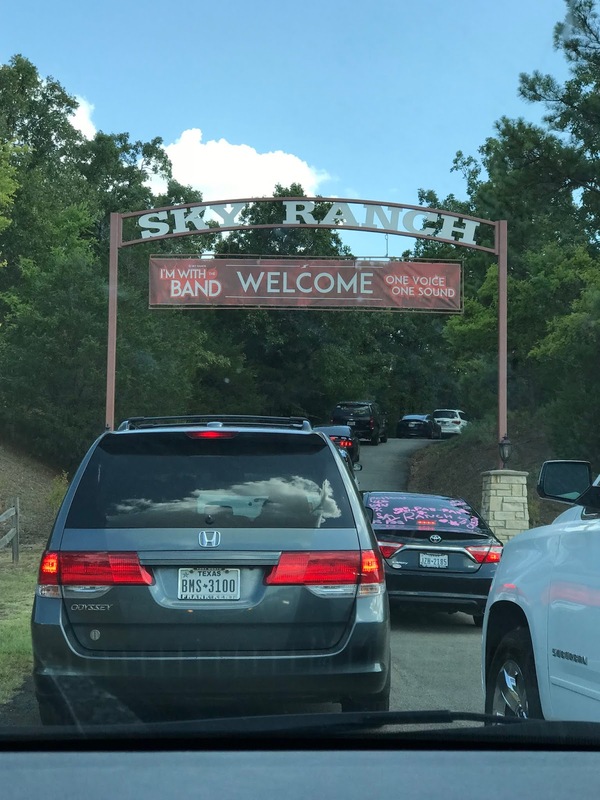 Aww, Sky Ranch looks amazing and I'm amazed at your packing skills! Mason will love what you sent along with him. Although I don't blame you for your tears at all...that would be hard! He's going to love his week at camp. Just picked up our three from a week of camp this past Saturday. Our 16 year old has gone for the past 10 years. Yesterday we sat on his bed talking for over a year about how much he missed camp and how sad he was that he only has 1 more year to go. He's decided that he wants to become a coach at camp so that he can give back what he's received. We are huge rooftop shouters of how important summer camps are for kids. Even though it was just a week, the maturing that happens is unreal! I hope Mason has a fabulous week (but I'm confident that he will!). I worked the past 3 summers at Sky Ranch and launch camp last year. It makes my heart SO happy to see him get to go. I love that your family trusts and invests in this camp. It’s great to see it from the parent’s side of it all :) Hope he has the best week! I feel like I comment this after every holiday post or birthday post, but seriously, your kids are going to have the BEST memories from their childhood because of the efforts you (and Dave!) put into their experiences. I can't think of a better gift a parent can give their children--the joy of appreciating life. You rock. Forever storing these nuggets of inspiration away for when I have my own babes. 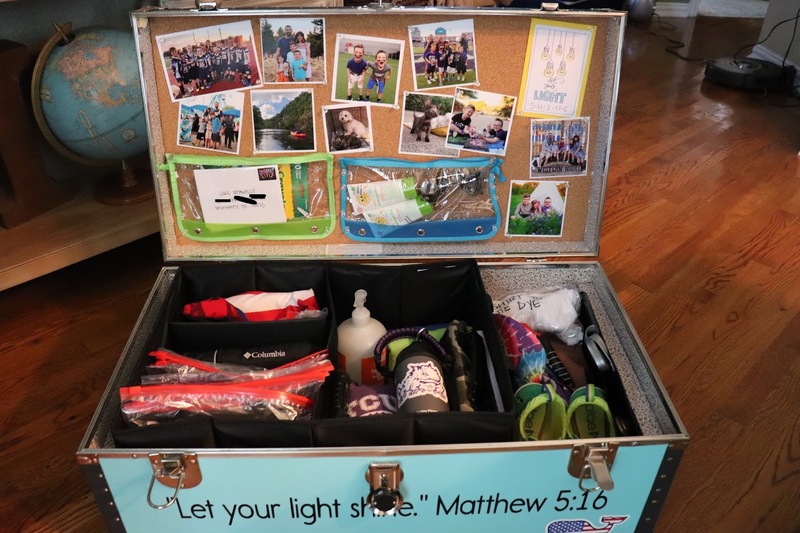 My 3 kids go to camp for 2 weeks in the summer and this year I kind of dropped the ball on the care packages (I actually ended up shipping them a few goodies from Amazon Prime) and my kids really let me know about it. HA! Next summer I really need to step up my game, especially since my 8YO will be going for the first time!! 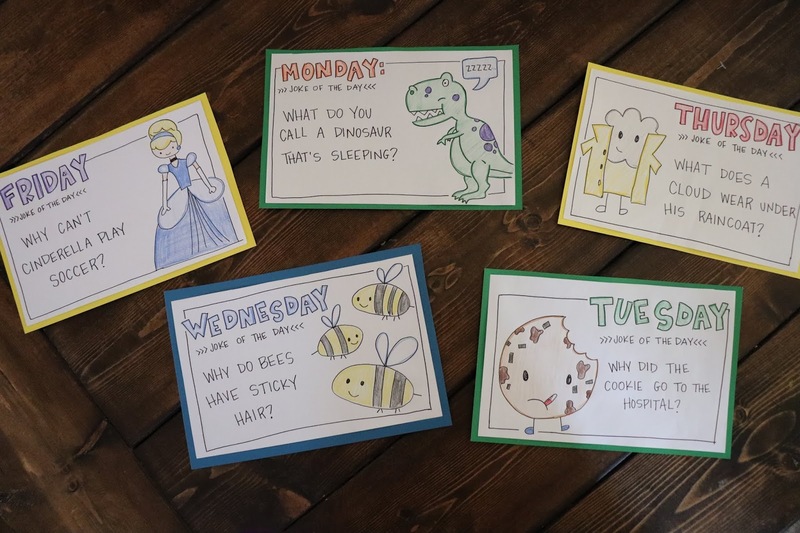 These letters and jokes are adorable and my kids would love them, but I have zero artistic ability. Any way you would be willing to make these printables?? You are so EXTRA, and I absolutely love it! Growing up, we only had Camp Currie one year in elem. school. It was all outdoorsy stuff like kayaking and archery and such, and this girl had NO interest! I did go to FBLA camp in high school to learn more about business shtuff, and it was fun, but nothing like the cool camps I hear about. Omg you are AMAZING!!!! I love the notes, and no lie, I want to set up a trunk like that for myself! My daughter has gone to sleepaway camp twice now. The first year I was so excited to pick her up, I just knew she had missed me, and would cry her eyes out when she saw me. Ha! I was so wrong! She took one look at me, got a big ol' scowl on her face and told me "I didn't even miss you, I don't want to go home, I WILL be coming again next year." Okay! She went again this year, and has had the best time both years. Next year will be her last year for this program, and I'm already dreading the fallout from that! LOL! Also, we did the daily ziplock clothes thing, and she LOVES that! She specifically asked for that again this year!